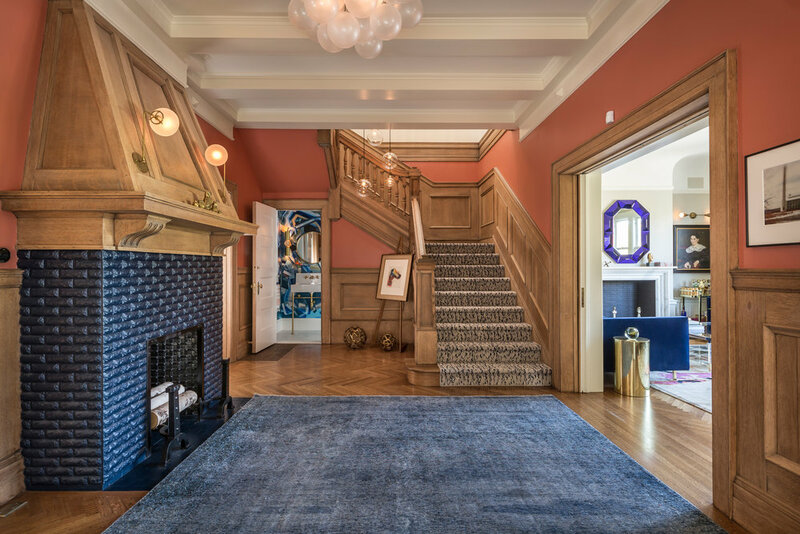 Prominently established on a corner fronting Alamo Square Park, this Edwardian home features six bedrooms, four and one half baths, approximately 5,745 sqft*, and one car parking. Known as “Little House”, the home was built In 1901 by notable architect Julius Krafft for its original owner, William Little. In recent years, the home has been tastefully and extensively renovated by HSH Interiors, with an impeccable attention to detail, in which bright colors and bold patterns are in delightful interplay with the timeless architecture. The stately façade of the three-story residence presents hallmarks of the Edwardian style, including the elegant etched glass, as well as subtle architectural hints of Arts & Crafts. 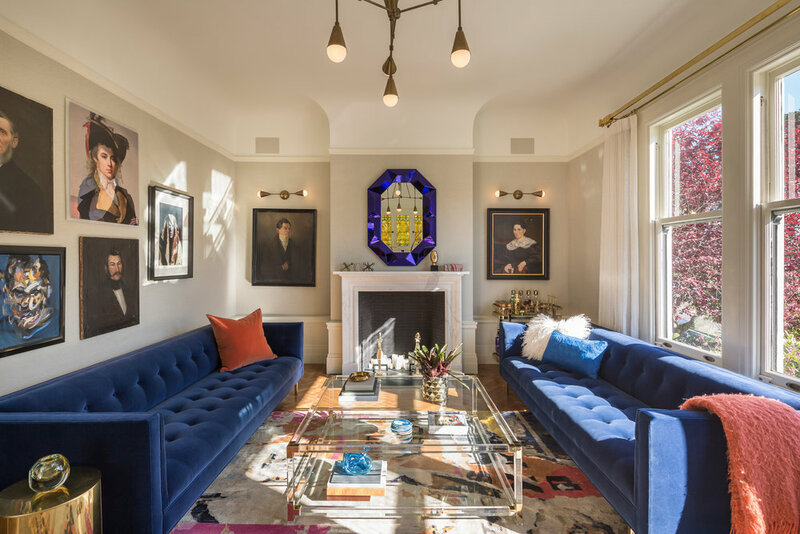 The generous interiors have been colorfully rejuvenated for stylish modern living while retaining classic elements of Edwardian influence, including regal moldings, richly hued wood paneling, handsome staircase railings, decorative stained glass, and carefully refinished hardwood floors. 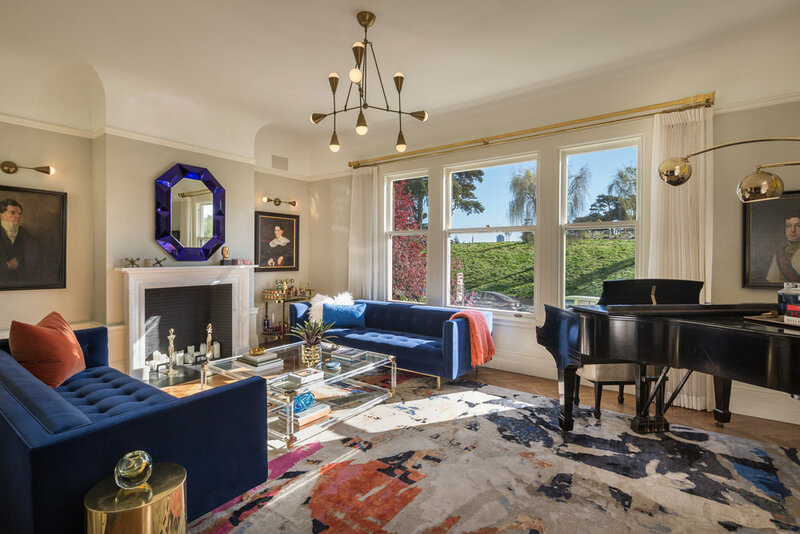 The formal living room encompasses a colorful sitting area with herringbone-patterned solid-oak floors, a fireplace, and views overlooking Alamo Square Park. Across the grand foyer is the refined formal dining room, which includes a built-in buffet, a second fireplace, a coffered ceiling, and handsomely paneled walls. 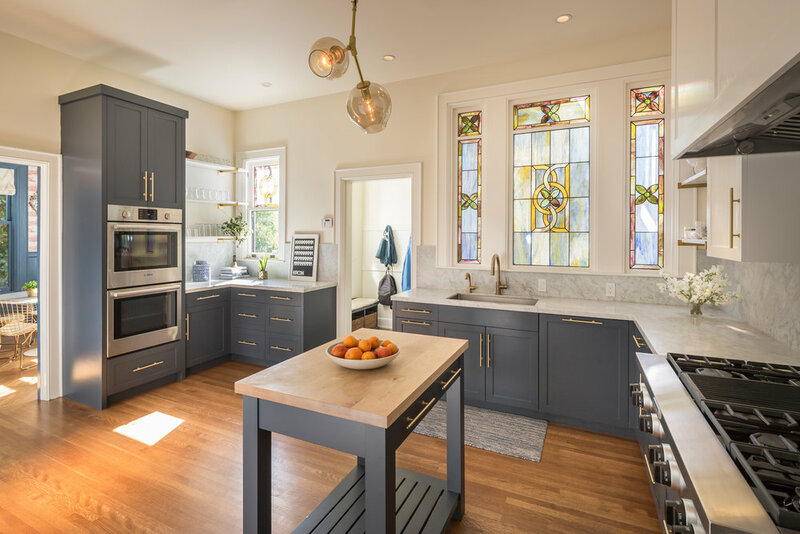 The kitchen features a delightful combination of old and new, with stained-glass windows, white Carrera marble countertops, double ovens, a six-burner gas range including a grill, as well as a convenient pantry closet. A breakfast room adjoins the kitchen and dining room, featuring such charming elements as a vintage china cabinet with decorative leaded glass and a period fireplace with eye-catching colorful tilework. Windows facing in two directions fill the space with light. Completing this level of the home is a convenient mudroom off of the kitchen and a vibrant powder room accented with impressive brass fixtures. From the foyer, a grand central staircase with distinctive lighting and a multicolored stained glass window rises to the second level, where a landing with hardwood flooring leads to three restful bedrooms. The master suite rests on the south-east corner of the home and features a fireplace, built-in bookshelves, and impressive outlooks to the adjacent park. The ensuite bathroom boasts distinctive tilework, a marble-clad shower, and a freestanding soaking tub overlooking Alamo Square Park and downtown San Francisco. Attached to the master suite is a spacious dressing room. On the western side of the home are two additional bedrooms and a timeless bathroom. A second stairway leads to the very private third level, which includes three bedrooms, a bath, an office, and a pentroom with built-in bookshelves. 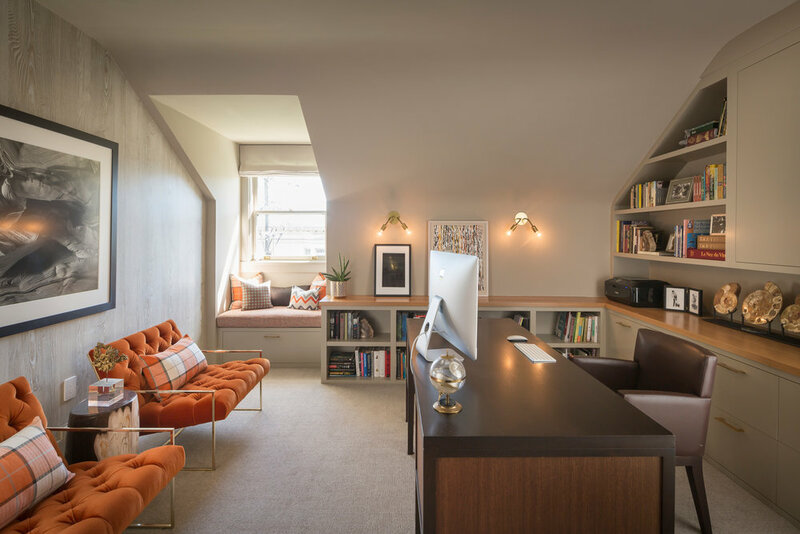 The pentroom overlooks the park below and can be utilized in a multitude of ways. The home’s versatile lowest level includes a generous laundry area, storage space, and a flex space. Secluded on the rear of the home is an astroturfed play area and a patio ideal for alfresco grilling. The garage can accommodate one car parking and accesses the home via the back staircase. 701 Scott Street is located within the heart of the Alamo Square neighborhood. 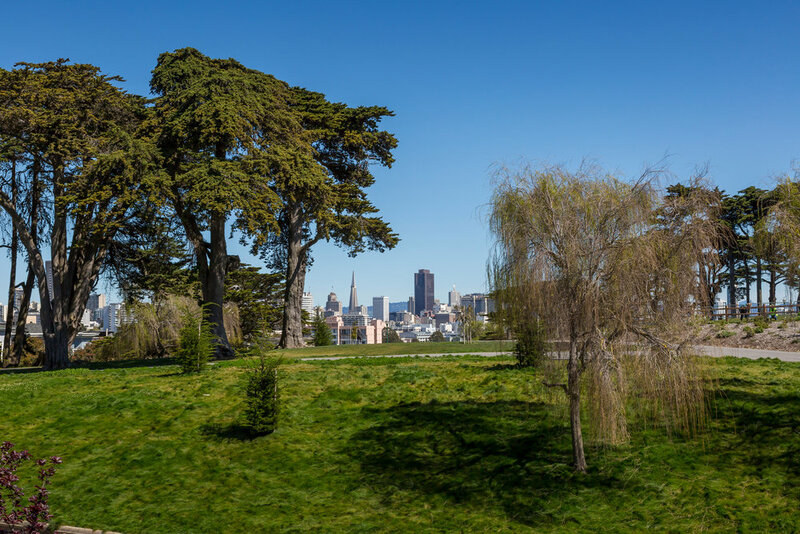 Alamo Square Park, just across the street, is a San Francisco landmark that includes a playground, walking trails, a tennis court, and the celebrated “Painted Ladies”. The bustling Divisadero corridor, which offers an array of restaurants, shops, markets, and other amenities, is just one block away. Popular destinations include Bi-Rite, 4505 Meats, NoPa, and The Mill, just to name a few.